On the 13/09/2018 we held a parents consultation to review and evaluate the accessibility policy and how Roundthorn could further promote equality of opportunity for children with Special Educational Needs and / or Disabilities and provide equal opportunities for all regardless of race, genger, sexual orientation, disability, religions or beliefs, gender reassignment, pregnancy or maternity. At Roundthorn Primary Academy, our aim is that all pupils will achieve their full potential. It is essential for children to develop a positive self-image and opportunities for success must be provided for every child. We believe that all children are entitled to have access to a broad, balanced and differentiated curriculum; and that every effort should be made to support each child in attaining the basic standards of literacy and numeracy which are essential in everyday life. We recognise that each child has individual needs and may have additional educational needs at some stage in their school career. These may arise from learning or behavioural difficulties, physical disability or giftedness. Children develop and learn at different rates and it is important that we view their progress in a positive way. We will look at what a child has achieved and plan the next steps in his or her learning, rather than focusing on what s/he is unable to do. We believe that early and efficient identification and assessment of pupils’ needs is essential so that targets for learning can be set and appropriate forms of intervention and support can be planned. Each pupil’s progress will be monitored closely and reviewed regularly in order to ensure that effective strategies are being used. We aim to work as a team to support each other, sharing ideas, resources and expertise. The SENCo is available to assist teachers in formulating Individual Education Plans (IEPs), setting targets, choosing strategies and resources and reviewing progress. Children with AEN are a vulnerable minority and, to protect their interests, we aim to ensure that SEN provision is given equal status with other curriculum areas. We are currently working towards gaining an accreditation for Special Educational Needs and / or Disabilities through the SENDIAS Award (Special Educational Needs and / or Disabilities Inclusion Award). We are working towards this award to showcase the work that we do to support these children at Roundthorn. The SENDIA offers mainstream schools the opportunity to gain accreditation for high-quality provision and outcomes for children with special educational needs and disabilities (SEND). The main aim of the award focuses on ‘outcomes’ for pupils and how we can demonstrate the impact of our SEND provision. The award leads us through a process of self-evaluation, action planning and evidence collection before final verification and accreditation. ★demonstrate to parents, governors and Ofsted inspectors that the school provision complies with current legislation and the SEND Code of Practice, and is effective in achieving good outcomes for all pupils. Please click the images below to go to their website. 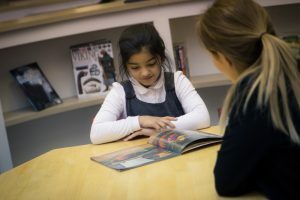 Please click here to find out more about our reading interventions.